Straight out of a 1950s American diner comes this bubblegum pink Drive-In Dress from Stop Staring. Providing something a little off the beaten track from the many retro styles around, this is the perfect day dress for lovers of vintage inspiration. 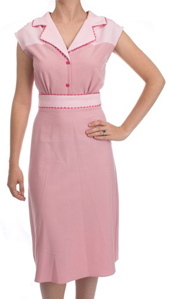 The flower buttons and perfect pink shades make this dress look great down to the last detail. Perfect for teaming up with some big hair and an even bigger Cadillac. Available from Mod Cloth, this one’s now in the sale at $110.99.